Sign up and become a member today - It's quick and simple! CosmeticTattoo.org is proud to announce its new online service which is available Internationally to Cosmetic Tattooists, those who provided products and services to the Cosmetic Tattoo Industry, and members of the public seeking Cosmetic Tattoo Services. CosmeticTattoo.org is a hybrid site offering a broad ranges of services to our members that far exceed any other offerings and enables industry members to utilize our cutting edge marketing tools. For full details about the enormous range of services that members of CosmeticTattoo.org can use read the publications in our 'Site Info' Centre under the "About CosmeticTattoo.org" category. All members have a members admin interface where you can log in and change any details, add special promotions (Deals) for CosmeticTattoo.org visitors and much much more! During sign up paid Members can also request consideration for a prestige status badge to be added to their listing, there is no additional charge for a status badge but badges are awarded based upon merit at the discretion of the site manager. A status badge lets the whole community (worldwide) know that you are person of eminence within the Cosmetic Tattoo industry community. A prestigious Master Trainer badge can be awarded to those International Trainers who meet our guidelines for Master Trainer status, for further details visit the 'Site Info' Centre under the "About CosmeticTattoo.org" category. A prestigious Education Team Member badge can be awarded to the author of an Article that is submitted to us and accepted for publication under our Educational Articles Category, Education Centre Team members only need to have an Educational Article published once every 6 months to retain their badge and a Free Elite Member Listing. For details on our publication guidelines for the submission of an Education Article please read our publication titled "What Is an Educational Article" under the About Articles category. Our Pink Provider program is our way of giving something back to the community, we encourage all our Members to become Pink Providers and offer lower cost and sometimes free services to Clients / Patients who have suffered a serious life threatening illness and if the service being requested is directly related to the illness. You can read more about the Pink Provider commitment by clicking this link. Members with an active account can also add a membership logo to their own website relative to their account level; Member / Advanced Member / Elite Member. Adding the logo to your website via our clever back-link feature will also boost your listings rank in our directory. In addition to our standard membership levels those with special qualifications and prominent larger business and companies can also choose to create a listing with one of our optional Detailed listing profiles available under "Listing Type", choose from Detailed: Business Profile / Legal Professional Profile / Medical Professional Profile / Health Professional Profile / Technical Expert Profile just select a detailed profile from the 'Listing Type' drop down when creating your initial listing. The listing types 'Eminent' and 'Executive' are intended for eminent persons and members of CosmeticTattoo.org Executive Group, both of those listing types are by invitation only. Once you start using our services you will wonder how you ever did without us, we are so confident that you will love being a member that we offer a 30 Day money back guarantee on Advanced & Elite annual directory listings. Oh, did we mention that our base membership level is completely free! Click on the Member, Advanced Member or Elite Member headings below to see what features are included. For maximum exposure and benefits we recommend an Elite Membership listing. Listing Features: Business Title, Address, Phone, E-mail to Friend, Add to Favourites, Ratings and Reviews, Offer a Special Deal. * Advanced Member listings appear in search results above Member listings. Listing Features: Business Title, Address, Phone, E-mail to Friend, Add to Favourites, Ratings and Reviews, Offer a Special Deal.. This is where you can have your own Summary Description about your business, up to 250 characters to catch the attention of a site visitor and tell them how good you are. Summary Descriptions are available for Advanced and Elite Membership levels. * Elite Member listings appear in search results above Member and Advanced Member listings. Has both Detailed Listing View & Summary Listing View! Listing Features: Business Title, Address, Phone, Fax, Web Link, E-Mail Link, Summary Description, E-mail to Friend, Add to Favourites, Can Apply for Badges, Offer a Special Deal, Ratings and Reviews, Photo Gallery, Contact Form, Video Snippet, Attach a File, Hours of work, Location. Plus: Your Logo Image, Detail Description, Print, Map, Photo Gallery, Contact Form, Video Snippet, Attachment File, Hours of work, Locations. Includes Social Media Integration: Mobile Check in, Facebook Like and Send button, Google +1 button. Elite Listings also appear on the home page of the site in the "Featured Listings" area in rotation with other Elite Members. If an Elite Member has an active Deal their deal will appear on the home page of the site in the "Featured Deals" area in rotation with other Elite Members. This is where you can create your own Full Description about your business, the full description displays on your own listing page for Elite Members and you have ample space to tell site visitors in detail about who you are, what your business has to offer, and any other details that you wish to add. Full Descriptions are only available for Elite Membership levels. You will also notice that there is integration with the social media channels with Facebook Like, Send to Facebook, Google +1 and Twitter, the social media integration gives your listing the chance of reaching a much wider audience. If you work in several locations or if your business has more than one shop front then naturally you will want to tell site visitors about all the locations they can find you. The Locations field is only available for Elite Members and is found on their listing page. This was by far the best choice available and I am so glad that I found this business, highly recommended. 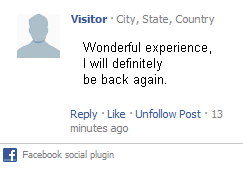 Thank you for the comments, I appreciate your business. Great business we would have no hesitation in recommending them to others, thanks so much! Click on the Basic Event or Premium Event headings below to see what features are included. Features: Title, Date, Time, Your Logo image, Address, Phone, Summary Description, E-mail to Friend, Add to Favourites. This is where you can have your own Summary Description about your event, up to 250 characters to catch the attention of a site visitor and get them interested in your event. Summary Descriptions are available for Basic and Premium Events. * Premium Events appear in search results above Basic Events. Features: Features: Title, Date, Time, Your Logo image, Address, Phone, Summary Description, E-mail to Friend, Add to Favourites. Plus: Driving Directions, Web Link, E-mail, Contact Name, Photo Gallery, Detail Description, Print. Includes Social Media Integration: Facebook Like and Send button, Google +1 button. Premium Events also appear on the home page of the site in the "Featured Events" area in rotation with other Premium Events. This is where you can create your own Full Description about your event, the full description displays on your own event page for Premium Events and you have ample space to tell site visitors in detail about who you are, what your event is all about, and any other details that you wish to add. Full Descriptions are only available for Premium Events. You will also notice that there is integration with the social media channels with Facebook Like, Send to Facebook, Google +1 and Twitter, the social media integration gives your event the chance of reaching a much wider audience. Click on the Basic or Premium Classified headings below to see what features are included. * Premium Classifieds appear in search results above Basic Classifieds. Features: Title, Address, Photo, Phone, E-mail, Price, Short Description, E-mail to Friend, Add to Favourites. Plus: Contact Name, Fax, Web Link, Detailed Description, Photo Gallery, Print. Premium Classifieds also appear on the home page of the site in the "Featured Classifieds" area in rotation with other Premium Classifieds. This is where you can have your own Summary Description about your Classified item, up to 250 characters to catch the attention of a site visitor and get them interested in the goods or services you want to sell, the job available, the Realestate listing etc. Summary Descriptions are available for Basic and Premium Classifieds. This is where you can create your own Full Description about your Classified item, the full description displays on your own Classified page for Premium Classifieds and you have ample space to tell site visitors in detail about who you are, what your classified advertisment is all about, and any other details that you wish to add. Full Descriptions are only available for Premium Classifieds. You will also notice that there is integration with the social media channels with Facebook Like, Send to Facebook, Google +1 and Twitter, the social media integration gives your Classified listing the chance of reaching a much wider audience. Create your own Infomercial Article and become better known to prospective clients and customers. Alternatively for just an additional $149 you can request to have your Infomercial Article created by a member of our Marketing Team, simply complete our e-Interview and we will take it from there. Features: Title, Publication Date, Author, Author URL, Abstract, Image, Content, Photo Gallery, E-mail to Friend, Add to Favourites, Print. This is where a your Summary Description about your Infomercial Article is shown, up to 250 characters to catch the attention of a site visitor and get them interested in your Article. Abstract: This is where a your Summary Description about your Infomercial Article is shown, up to 250 characters to catch the attention of a site visitor and get them interested in your Article. This is where the full details of your Infomercial Article are located, you have ample space to tell site visitors in detail about who you are, what your Article is all about, and any other details that you wish to add. You will also notice that there is integration with the social media channels with Facebook Like, Send to Facebook, Google +1 and Twitter, the social media integration gives your event the chance of reaching a much wider audience. Infomercial Articles are one of the most powerful forms of advertising that you can invest in. Don't forget that you can also request to have your Infomercial Article written by a member of our Marketing Team after completion of an e-Interview, further details are above on this page. Click on the Top, Bottom, Featured, or Sponsored Link headings below to see what features are included. Return on Investment - Use our reporting tools to see how your advert is performing! No more a wasting money on unrelated sites via overpriced ad word campaigns, our site visitors want to know about your products and services! As well as the Banner Advertising listed below you can also request an Advertisement on the Slider on our front page which is the preeminent advertising position on our site. Top Banners are located in a premium banner position on the site and offers maximum exposure for your business. Bottom Banners are located in a discrete position and is more likely to be seen by site visitors who are on the site for a longer period of time compared to those who are just passing through, some advertisers regard this to be more targeted advertising towards customers who are closer to making a decision. For example bottom banners may be clicked by a site visitor after reading an article or other page contents at the point of reaching the bottom of the page, for this reason Bottom Banners are often used in combination with other advertising on the site e.g. an Infomercial Article. Featured Banners are located very close to the site navigation menu, site visitors who don't have time to waste and want quick answers may click on a Featured Banner in preference to using the site navigation menu to offer them range of business choices. This type of customer may be a fast decision maker and 'want it now' opting for the first choice over making a selection from a range of choices. Sponsored Link Banners are plain text advertisements located very close to the site navigation menu just below Featured Banners and they offer advertisers a similar opportunity as a Featured Banner but at a more cost efficient price for the advertiser, sponsored links are often used in combination with other advertising on the site e.g. an Infomercial Article. A sponsored link can provide subtle 'Brand Name Reinforcement' as a site visitor makes a selection from the site menu this can result in greater recognition when they see your directory listing and site visitors who don't have time to waste and want quick answers may click on a Sponsored Link Banner in preference to using the site navigation menu. Some research has shown that plain text adverting banners can achieve higher customer response for advertisers in some circumstances, it may be the simplicity factor.